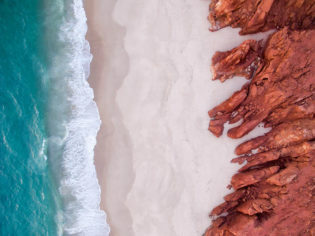 Besides its inconceivable colours, the best thing about Cape Leveque is that you'll probably have the beach all to yourself - so nudie swims are encouraged (photo: Dillon Seitchik-Reardon). Hot springs, gorges, turquoise plunge pools, waterfalls and white sand beaches – we discover the best places to swim in The Kimberley. It’s hard to believe that Western Australia’s Kimberley region is around twice the size of my home state of Victoria. For most of us, it’s probably the biggest place that we know nothing about. A distant world, tucked into a faraway state. A collision of the Outback and tropics. “It’s pristine land with one of the lowest population densities on the planet,” says local guide Scott Connell from Kimberley Spirit. We’re chatting to Connell on the sidelines of Emma Gorge in El Questro Station, the first stop on our swimming pilgrimage from Kununurra to Broome. “People don’t realise until they get here, but this place is the swimming capital of the country,” he laughs before plunging into the crisp, turquoise water. Given a superficial look across the dusty, dry savannah landscape it seems unlikely that this region could be the capital of anything but sunburns, yet here we stand among palm trees and delicate maidenhair ferns. Year-round springs feed deep gorges and wide rivers. Red cliffs fall into white sandy beaches. The Kimberley raises the eternal question, if you take a picture without an internet connection, did it even happen? Emma Gorge is arguably the Gibb River Road’s best pit stops, for obvious reasons (photo: Dillon Seitchik-Reardon). Dotted along the rough track of the Gibb River Road are a series of rocky gorges that lead to waterfalls and rock pools. If you’re coming from Darwin, El Questro (where most of these spots are located) might be your first stop. The dramatic Emma Gorge falls pour over 65-metre cliffs into a large plunge pool at the end of a hike along a riverbed, 1.6-kilometres into the gorge. The track begins at the Emma Gorge Resort and winds past another deep turquoise pool, (arguably the better spot to swim). At the falls, the water is refreshingly cool, shaded by the high cliffs of the gorge for the most of the day. The crystal clear water of Mac Micking Pool at the end of El Questro Gorge, a small year-round waterfall that is cast in angelic light around midday (photo: Dillon Seitchik-Reardon). An adventurous 9.4-kilometre return hike weaves you up a narrow, tropical rainforest gorge shaded by Livistona palms. Ferns and snake vines cling to sheer cliff walls while tropical birds, frogs, and dragonflies frolic in primordial bliss. Queue the Jurassic Park theme song. The first pool is about 1.3-kilometres into the gorge, identifiable by a large boulder that you must climb to continue upstream. The trail ends at the crystal clear water of Mac Micking Pool, a small year-round waterfall that is cast in angelic light around midday – one of the best showers in the state. We recommend packing lunch and water and spending the day in this gorge. This little oasis is a series of small thermal rock pools, tucked under spiral pandanus and towering palms. The water sits at a balmy 28°C year-round, which is surprisingly refreshing. Climb and slide between shallow pools, relax under small rapids, and kick back like you’re in a day spa. Long chats and storytelling come easily here, which makes it a great place to swap tales of life on the road. Try not to wear sun cream in the water to keep natural springs clean. At the western end of the Gibb River Road, Bell Gorge is a necessary side trip. The 40-kilometre unsealed road passes through a couple of fun river crossings (4WD required). It’s a further two-kilometre hike into the gorge, with great views along the rim. Shallow pools spill over a staircase cascade into the deep, round plunge pool below. The pristine water here is deep, cool and so sweet you can drink it. Follow the gorge further downstream for smaller, private rock pools. After days or weeks travelling overland, there is a special relief in first seeing Broome’s sapphire coast, and receiving the most welcome sea breeze of your life. 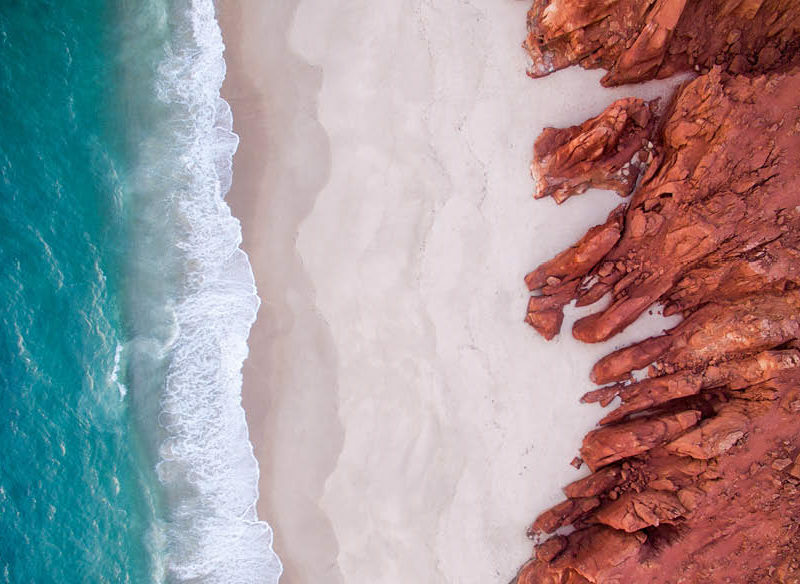 A swim at Cable Beach shouldn’t be missed while you’re passing through town, but going north into the Dampier Peninsular is where the beaches really start to blow your mind. Impossibly white sand is straddled by clear blue water and red rocks, and you’ll likely have these beaches all to yourself – a nudie swim recommended. – Check with a local guide or information centre about water flow and what condition the water is in at each water hole. Many swimming spots are closed in the wet season (November–February). – Check with someone about the condition of the roads. You will need a 4WD to access most spots in The Kimberley. – You will need parks pass to get into the national parks. These can be purchased at visitor centres or on entry to most car parks. – This is croc country, so always check with a local before swimming. Went to the first three in June, 2017. We are going back next year to do Bell and Cape Leveque. Emma Gorge has a thermal inflow on the far right entry side. 30 to 35 degrees. Magic.